DETROIT -- Ford Motor Co. posted a 1.5 percent increase in U.S. light-vehicle sales last month, even as F-series deliveries declined to the lowest level since January. 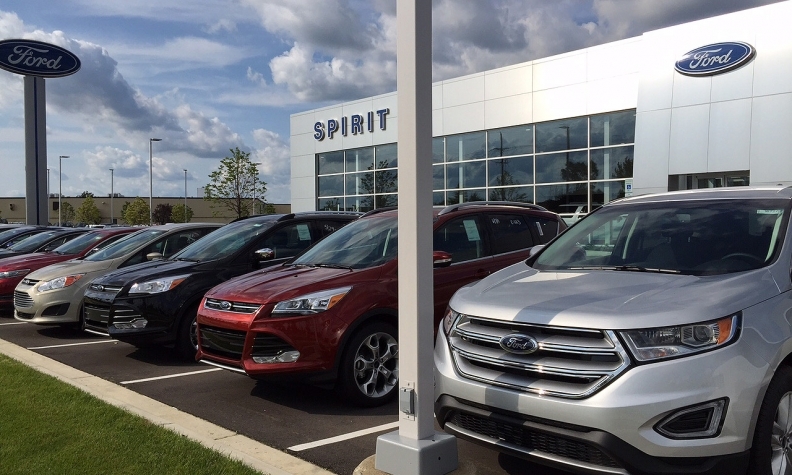 Fleet accounted for 35 percent of Ford’s sales in June, the highest proportion in two years, even though Ford is diverting nearly all of the F-150s it’s building to retail customers until it can accumulate more inventory. Ford’s fleet sales rose 3.8 percent, while retail sales were up 0.5 percent, the automaker said today. Ford’s U.S. sales and marketing chief, Mark LaNeve, said the June fleet increase was a “pure timing issue” with filling orders from rental-car companies, which accounted for 18 percent of Ford’s sales last month. He said F-150 fleet orders would be higher in the second half of the year, with inventory of the aluminum-bodied truck reaching normal levels by the end of September. LaNeve said Ford started June with 75,000 F-150s in inventory, down from 141,000 a year ago and still well below its target level of 120,000 to 130,000. F-150 production reached full speed in early June, concluding a lengthy model-changeover process that began in late 2014. Sales of the F series, which include both the F-150 and Super Duty, fell 8.9 percent in June and 2.4 percent in the first half of the year. At the same time, Ford’s average transaction price for the F series surged $3,700, or 9.2 percent, from June 2014, to $44,100. “I’ve been looking at these numbers on pickups for a long time and it’s just an incredible number,” LaNeve said. Those figures are after incentives, which were flat on the F series from May and down $640 from a year ago, Ford said. LaNeve hinted that F series incentives could increase in the months ahead, in response to steeper discounts on competitors’ trucks. Some Ford dealers were advertising up to $11,000 off sticker price on the 2015 F-150 in June, which LaNeve said were isolated offers to match deals advertised by rivals in those markets. In June, Ford sold 12 percent more utility vehicles, 4 percent fewer cars and 1.1 percent fewer trucks. Sales of Ford’s newly redesigned Edge and refreshed Explorer each rose 30 percent. Mustang sales were up 54 percent. The Transit van had its best month since its introduction a year ago. But the Fusion, Focus, Taurus, Escape and Transit Connect all declined year-over-year. Sales rose 15 percent for the Lincoln brand, thanks to a 185 percent increase for the MKC small crossover. In the first half of the year, sales rose 733 percent for the MKC and 60 percent for the Navigator, but the rest of the brand was down 24 percent. Ford said it began shipping the redesigned Lincoln MKX to dealers in June. That vehicle could help the brand finish the year stronger. Overall, Ford sales are up 1.9 percent for the year. Fleet accounts for 31 percent of the automaker’s sales in 2015, down from 32 percent in the first half of 2014. Rental-car companies accounted for 13 percent of Ford sales in the first half of this year.